The information technology field is in a state of rapid evolution, and IT specialists and experts are looking for ways to stand out in this highly competitive field. Penn State World Campus, the online learning platform of Penn State, is pleased to offer a variety of technology and science programs with accessible entry points for everyone from relative newcomers to the IT field, to long-established IT professionals. Penn State World Campus offers graduate and undergraduate certificate programs that allow students to earn a Penn State credential with as few as 15 credits, as well as degree choices at the associate, bachelor's and master's levels. Penn State's reputation for leading research and forward-thinking curriculum is reflected by a wide variety of programs that prepare students for careers in fields like cybersecurity, enterprise architecture, learning design, security and risk analysis, and many other technical fields. Learn more about the complete family of IT programs. When working professional Chase Kelly decided he wanted to further his education, his demanding military schedule required him to narrow his search to online programs. After conducting extensive research, he chose to apply to Penn State World Campus, where he enrolled in an online program to work toward his Associate in Science in Information Sciences and Technology. For Chase, the decision to enroll was an easy one. "I grew up in that region, and already knew how great Penn State is as a university. So when I saw that online program option, I was sold. I didn't have to look anywhere else after that." Over the course of three years, Chase earned his associate degree, all the while applying his classroom learning to improve his performance at his job. "I spent 10 years in the navy and after that, I transitioned into private industry, training navy personnel. Because everything's become so network-and technology-reliant, my course work from Penn State World Campus directly impacted my ability to excel at my job. One week I'd be doing something in the classroom or doing something online with my course work, and the next week I literally go into work and I know what that new piece of equipment is and I understand how it works." After graduating with his associate degree, Chase decided to continue his education with Penn State World Campus, and is currently pursuing a Bachelor of Science in Information Sciences and Technology. "Being a Penn Stater is about community. Everybody I've worked with from day one — administrators, the registrar — everyone's been so helpful. The professors and students I've met through my classes or through the Blue & White Society student organization have made me feel very connected. It's a big family; everybody I talk to makes me feel really connected and part of the Penn State community." Jamie Reep is another working IT professional who chose Penn State World Campus to pursue his degree. Through years of hard work and dedication to his employer, Jamie had advanced to the position of vice president of technology. Yet he found himself yearning to complete the college degree he had started years ago. As a vice president, he had an incredibly demanding schedule, and was also helping his wife raise their two young children, so he knew the scheduling flexibility offered by online learning was his only option. He began to research online degree programs. "That was what I was looking for, so I applied that very day and was accepted about four weeks later. The rest, as they say, is history." Balancing his schedule proved to be extremely challenging, but Jamie found the flexibility of his online course work, combined with his determination to finish his degree and the continuous support of his wife, kept him motivated and on-task in his academic work. Jamie was also impressed by the professionalism and helpful nature of the faculty and staff. "Everyone has been very, very helpful. From the people in career services, to the Blue & White Society, they truly want students to succeed. The supportive environment really enriched my educational experience and helped me finish my degree." Jamie ultimately completed his degree, graduating with a Bachelor of Science in Information Sciences and Technology. He parlayed his degree into a new career and is currently pursuing his Doctor of Philosophy in Information Sciences and Technology at the Penn State University Park campus. Jamie's time at Penn State World Campus has had a profound impact on him. "It was the realization of a dream that I've had from the time that I was young. I always wanted to have my degree, but things in life got in the way, and I wasn't able to finish when I started. I'm the first in my family to graduate from college with a four-year degree, and they're all proud of my accomplishment." No matter where you are in your IT career, or where you would like to go, Penn State World Campus has a degree or certificate that can help you get there. 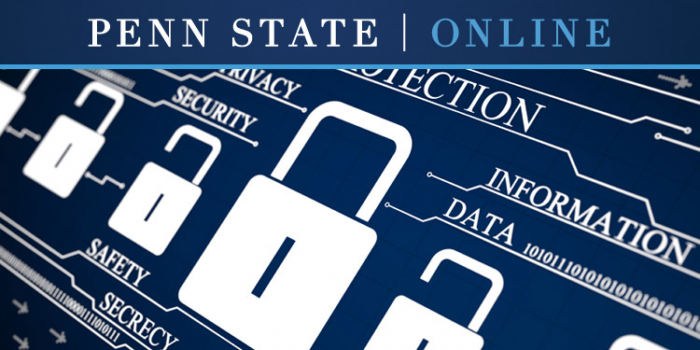 Learn more about the complete Penn State World Campus family of IT programs.